The new Elementor 2.2 includes some new great features, as well as a name change to an existing Elementor widget. Navigator is a navigation tree window that provides easy access to every element in the editor. It enables the user to drag elements throughout the page and edit them, quickly and easily. Navigator is particularly useful for long pages or pages with complex multi-layered designs, as well as for elements combining Z-Index, negative margin, position absolute, etc. It enables you to gain full control over the entire editing process. Starting from version 2.2, once you start typing in the URL field, the system will automatically search for the text throughout all pages, posts, and media files in your WordPress. Shortly after the 2.1 release, we received several requests to restore the previous edit handles. Therefore, in this version, we brought them back, alongside the right click.Go to Settings > Advanced > Editing Handles > Enable. We added the ability to better debug the pages you load. The Debugger will help you understand why a particular template or theme file is being loaded, or whether they conflict with each other. in the wp-config.php file, then the Debugger will automatically be activated. To manually activate the Debugger, go to the settings area of Elementor, and under Tools > Debug Bar > set it to Enable. 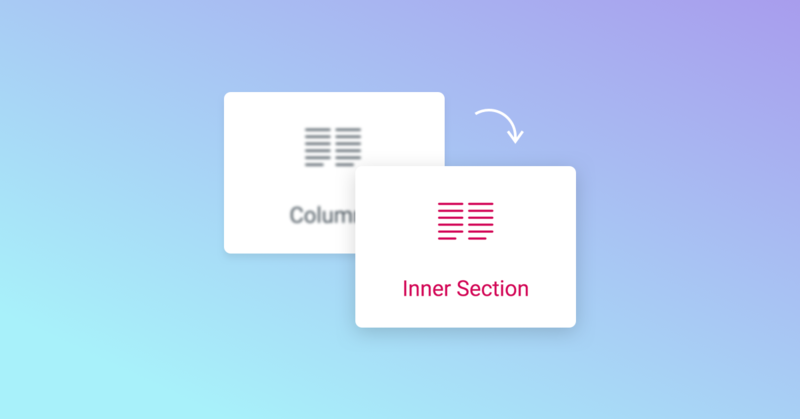 We renamed the ‘ Columns’ widget to ‘Inner-Section’ widget. We have made the change because, after a continuous period of user-research, we found a disturbing common mistake made by users of all levels. When users needed to add a column to an existing section, instead of doing it using the right-click > add new column, users mistakenly dragged the Columns widget. This mistake adds unnecessary markup code to the page and may cause various unexpected behaviors.